Informal feature names of Pluto and Charon, from the first research article on the New Horizons results. 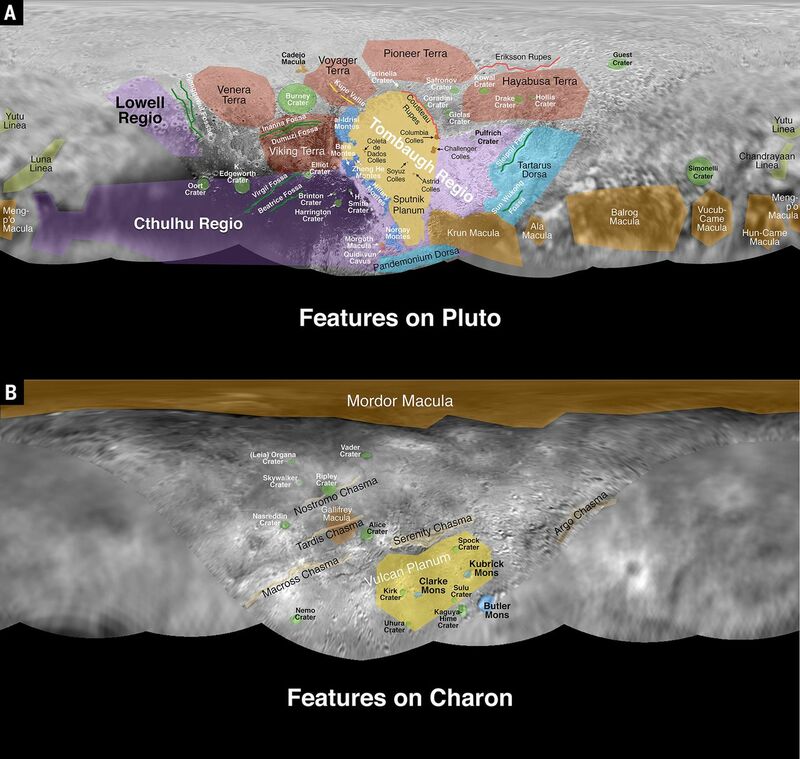 On Pluto, spacecrafts are commemorated, while on Charon, Star Wars and Star Trek characters populate the map. The IAU Working Group for Planetary System Nomenclature has approved names for three craters and the Chang’e 3 landing site on the Moon. Chang’e 3 landed on the Moon on 14 December 2013. The Chang’e 3 landing site is named “Guang Han Gong”, after the Moon palace where Chang-E and Yutu lived in Chinese mythology. Three craters nearby were named Zi Wei, Tai Wei, Tian Shi, after the “three enclosures in Chinese ancient star map”. According to the rules of IAU, craters on the Moon can be named after the followings: “Deceased scientists and polar explorers who have made outstanding or fundamental contributions to their field. Deceased Russian cosmonauts are commemorated by craters in and around Mare Moscoviense. Deceased American astronauts are commemorated by craters in and around the crater Apollo. Appropriate locations will be provided in the future for other space-faring nations should they also suffer fatalities. First names are used for small craters of special interest” (Source). We note that no Russian “landing site name” has been approved on the Moon but 12 small “Lunokhod-1 landing site features” were named after Russian common names, in 2012. Lunokhod 1 landed on the Moon on November 17, 1970. Sources of quotations: Gazetteer of Planetary Nomenclature.